Chandigarh, August 28 – Punjab deputy chief minister Sukhbir Singh Badal today asked Union home minister Rajnath Singh to investigate all international funding being received by Aam Aadmi Party (AAP) to detect suspected funds coming in from radical elements who were hell bent on destabilising Punjab before the 2017 assembly elections. In a letter to the Home minister, Mr Badal, who also holds charge of the Home portfolio in the State, requested Mr Rajnath Singh to launch an immediate investigation into the huge amount of money being received by AAP from abroad. He said this included funds being sent into the country by radical elements through surrogate organisations. “We need to investigate these organisations, their source of funding, the people behind them as well as their agenda for sending funds to AAP”. Mr Badal said this was a very serious matter as attempts were being made by some extremist elements to disturb the hard won peace of Punjab. He said such elements should not be allowed to succeed at any cost. The Deputy CM also detailed how AAP was aligning with radicals in the State and also holding regularly meetings with them. He said it was due to this that radical groups which had earlier been completely marginalised were becoming active again. “According to our information an understanding was reached that AAP would hand over the SGPC to the radical Sikhs in lieu of support from them to win the next assembly elections”. He said it was under this understanding that radical elements collected together under one fold to organise a so called Sarbat Khalsa conference to open a front against the Shiromani Akali Dal (SAD). He said AAP supported the radicals in this venture and even the features of the website used for this event were incorporated by AAP for its own site later. 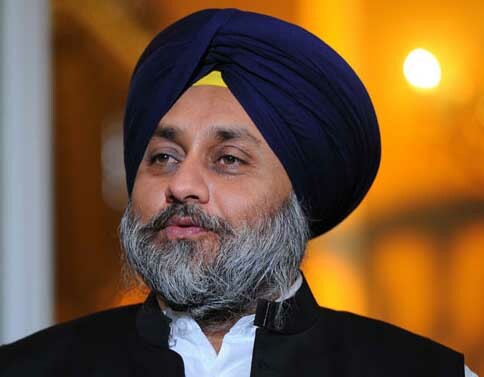 Mr Badal said later incidents of sacrilege had also implicated AAP with its Delhi mla Naresh Yadav being arrested for master minding a sacrilege incident in Malerkotla. He said besides this the State government also had intelligence that anti-national elements were behind a number of other sacrilege incidents in Punjab in which blasphemy was committed against the Sri Guru Granth Sahab ji. He said there was also intelligence that extremist elements were targeting important personalities for assassination in Punjab. He said the assassination attempt on Punjab RSS vice president Brig Jagdish Gagneja was part of this conspiracy. The Deputy CM said he had conveyed this information to National Security Advisor Ajit Doval earlier. He said he was following up this with this letter as there was a real threat to Punjab due to the support being given to the radical groups and their cause by AAP leaders one of whom – Jarnail Singh had even addressed a Khalistani function in London. He said open support from AAP which could also be receiving funds from radical elements residing in various foreign countries would embolden them to destroy the peace in Punjab. He said this should be stemmed immediately as this motive was in league with anti-national elements who wanted to strike out at India by destabilising Punjab.